Maid. I need a maid. Clean and dirty clothes are piling up. It’s a pain to know that there are tons of household chores waiting to be done, and yet, I am sitting here, typing my blog. I feel quite guilty now. What makes things worse? My friends are coming to my house for a gathering this weekend!! How am I supposed to clean my house within these few days to welcome them with open arms and ‘open bedroom doors’? You must be wondering, what I mean by ‘open bedroom doors’? Hahaha… People like me, super, duper sluggish (at least I admit, ok!) will often think of shortcuts to deal with ‘cleaning and tidying issues”. I don’t understand why friends like to come to my house for mahjong, watch dvd, chit chat, dinner since I often confine their movement within the living area. The rest of the areas are of course restricted area, a.k.a, dumping area. 3. doors of dumping areas should usually remained shut (sometimes locked) when guests are around. 4. to portray an impression to guests that the house is spick and span and owner is a neat person. Having said, I decided to create a hate list. Have to organise what to hang, what to fold, what to keep in drawer. *roll eyes* Sometimes I wish I can wear uniform to work, so I don’t have to crack my head in the morning and search through piles and piles of clothes to find a top. After finding, still need to iron. Aye…. Morning is already so sucky and yet I still have to do ‘adhoc housework’. Monthly magazine subscriptions are terrible. They just get into you mailbox, when you least expect it to come. I realised that I have a pile of subscribed magazines still wrapped nicely in clear plastic sheets. When do I have the time to read them? Where can I find space to store them? Thinking of storing them is a pain! The mattress (king size) is 3 times my size and I have to handle it alone. Can you imagine that?! Obviously, the 5 chores encompass the basic household chores that a house owner should do. So conclusion? I need to get a part time maid. Does weight really matters to a woman? Recently, there have been numerous news reports or rather slamming on incredibly skinny runway models, banning them from catwalk. Personally, I don’t see anything wrong. Apparently, models SHOULD be thin, cause slimmer women looks better on all apparels, be it chunky sleeves, bubble dress, latter-day grunge layers (which so happened to be the current fashion trend). The models still look excellent and slim effortlessly on those clothes that will typically look fat on a woman who has an acceptable weight. With that kind of pictures running on the magazines and television programmes, which women on earth will think that they are thin ENOUGH? I weigh myself twice a day religiously, just to make sure I stay within the underweight range. It seems that in today’s world, not only runway models are dying to strive for an underweight or unhealthy look, gals around me are also trying to attain that. Or at least majority of my friends. They try all means and ways to be thin or to stay thin… even that would mean stuffing medicines or rigorous exercises. They fluster and flare over their slightest change in weight. I admit, I am just like one of them. I turn green in envy when I see slimmer women, my face burn red in anger when I see a 0.2kg gain in weight. But I am lazier, I don’t exercise, I don’t take medication unnecessary. Every time when I feel like eating ice-cream or devour that deliciously looking mud pie, I contemplate. Those words keep on repeating itself like a loud speaker in my mind. And of course, there are several times where my mouth refuses to give in to my brain. I just eat and eat and eat… but I feel culpable after that hearty meal or sinful desserts. Recently, I find myself really lack of disciplines, one day it was steamboat (with lots of desserts), the other day it was ribs and beef, the other day it was curry… Hmph!! It’s time I should really impose some self-control, as I have gained alittle, which I don’t even dare to think about. Many people told me that I am skinny and one of my friends even go to the extent by saying that I looked anorexic. I mean, who cares? I don’t care. I just want to be thin and slim. I know it is unhealthy and many people vehemently against the idea of me going on a diet, despite of my underweight frame. But somehow, being a stubborn gal, I know what I am doing and know what my limit is. I know I am underweight, but I also know that I look better on clothes when I’m underweight. I know I am underweight, and I will not lose any further. I know I am underweight, but it is better than being overweight. I know I am underweight, and trust me, I still eat snacks and chicken chops twice a week. Don’t worry, I am not anorexic. I am just thin. Another thing, ask ten guys, do they prefer a chubby woman or a slim woman? I bet 8 of them will opt for a slimmer woman. This is life and this is reality. when we look back at now will our jokes still be funny? still be trying to break every single rule? will heather find a job that won’t interfere with her tan? an we make it somehow? will these memories fade when I leave this town? All of a sudden, I feel like writing about friends. Then, after Os, we split, getting on different tracks. Then, poly friends comes along. Poly friends are more matured. They are the ones who taught me about lives, and why I should work hard to get the Dist.... they are the ones who motivated me. 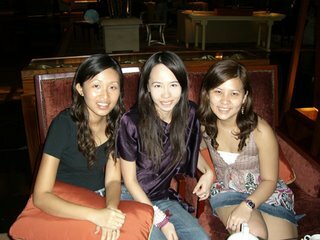 Friendships are indeed the most important thing in life next to kinship. To all my friends (whom I still keep in contact and those who drifted apart), thanks for playing a role in every stage of my life, you may not be the lead actor or actress in my show, but I can say that you are the best supporting actors and actresses. Cheers! Here's a gathering pic took recently. I wonder why the rest couldn't be bothered to attend the gathering. Never am I a fan of Korea dramas. "My Sassy Girl" failed to tickle me, "Winter Sonata" failed to move me, Rain failed to intrigue me (in fact i find him sligthly disgusting, always sweating and panting away) and I always think that Bae Yong Jun is nothing close to "handsome", he looks like a meat loaf, nothing else, but meat and more meat. Hmmm... but recently a mahjong kaki of mine lend me a Korea drama, "My Name is Kim Sam Soon". Politely, i accept her offer and watched the first episode during my mc. I must say, I AM GLUED TO IT.... YES... I don't believe it. It must be him. 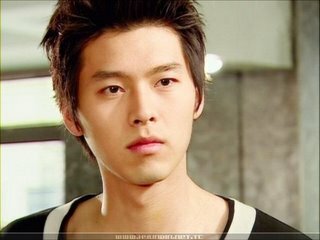 He is, Hyun Bin. He totally swept me off my feet, and I have fallen head over heels for him. Just for him. Hyun Bin (현빈; born 25 September 1982) is a famous South Korean actor. He is noted for his role in the popular television series My Name is Kim Sam Soon. 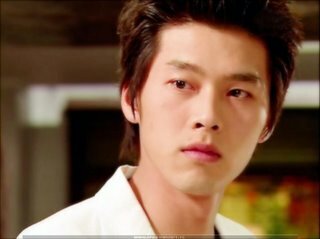 He also starred as the main character in the Korean movie, Millionaire's First Love (2006). Also, he has been in commercials for the company Cyon, which advertises cellphones mainly by LG. His given name is Kim Tae Pyeong. Some people said he looks like Kevin, but I beg to differ, his lips are thinner, his nose is sharper, but in some way, certain angles, they do resembles each other, perhaps 10%-20%... so does that mean I should be happy? I am going to buy all the dramas and movies which he had previously acted. I declare him as my idol now. Ok, I am going to “lash” it out. My lashes. It seems to have a life of its own. It seems to generate lots of unwanted attention. There are not real for sure. They are extended. There’s a name for extended lashes, which is called LASH EXTENSION. "Lashes are semi-permanent synthetic lashes that can last up to two months. The lashes are single strands of synthetic eyelashes that are curved to replicate a natural eyelash. They provide length and thickness to your own lashes. They are applied to individual eyelashes, one lash at a time, for an elegant, natural and luscious look. There is no need for mascara or an eyelash curler. Thicker, longer beautiful eyelashes that are safe in the shower, while swimming, sleeping or exercising." So get it? And let me declare, I AM ADDICTED TO IT. Not because I enjoy getting the attention, not because it is affordable (which they absolutely are not! ), not because I can attract guys, definitely not because I have ample money to splurge on. Needless to say, lash extension don’t come cheap. Per session cost me approximately $300. Cost applies for touching up for every 1 month. How to handle such obsession? I simply don’t care.